Welcome to the Happy Dragon. 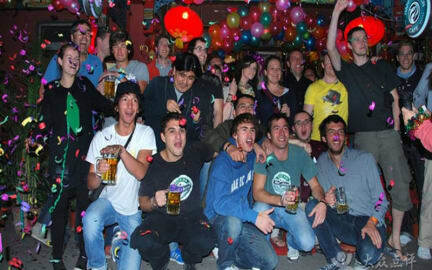 Backpackers Hostel, your happy home in Beijing! Our hostel has been opening for 7 years, we have established a great reputation as being one of Beijing best hostels, offering everything a guest needs and more! All rooms are cleaned daily and are well-maintained, with reading lamps, bed curtains, lockers in the dorms and drawers/cupboards/hangers/shower rails. You can use hot/cold air-conditioners and free extra blankets or a heater if you need. We have a 'quiet policy' for late at night so you can sleep comfortably as, although it's a fun hostel, we still know our guests need a good night's sleep. All rooms feature ensuite western-style bathrooms with 24hr hot showers and free towels, linen, shampoo and body wash.
We offer a choice of American, English or Continental-style breakfasts. Our restaurant has Chinese and Western food menus and there is a no-smoking policy in our restaurant. There is free Wi-Fi throughout the premises as well as web access in the lobby, featuring headphones, microphones, webcams, USB connections – and Facebook when it’s available! We also offer free internet connection sockets in every room. There is a 24 hour reception and security and our staff are available around the clock to help with all your needs. We have secure key-card access, a printing and photocopying service, a postal service (with stamps for sale), phone cards, free luggage storage, an efficient laundry service, on-street and free parking, bicycle hire/tours and parking, hair dryers, a tours desk and a taxi-booking service. We’re happy to help you buy new SIM cards and recharge your phone. We can also advise you about onward travel to other destinations, with free local, city-wide and national travel info. Our facilities include cable TV, a refrigerator and a free library with a good selection of Chinese, English and foreign language books, plus travel guides you can read, photocopy or swap 2-for-1. 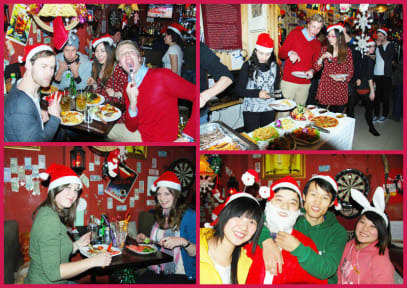 This is one of the very few hostels in Beijing to have a real bar, so the atmosphere is great for meeting fellow travellers and other guests. It’s like a big family, being relaxed whilst being super-clean and tidy. We have a full tours programme to take you to the must-see Great Wall, plus a variety of spectacular shows that are guaranteed to impress. Tell us anything you need and we will do our very best to help. We take pride that our service standards are second-to-none, and we guarantee that your stay will be happy, entertaining, memorable and excellent value-for-money. We prefer the personal touch when catering for our customers; staff are more than happy to chat with you. You can learn some Chinese and get the best tips for where to go and how to get the best deals when out shopping – or even if you just need advice. Our friendly staff are enthusiastic and able to help you with everything; most have years of youth hostel experience and are fluent in English as well as having leisure and tourism training and experience (some are also qualified English tour guides). In addition we can also help you book domestic and international flight and train tickets as well as being able to book you hostels throughout China. We can also arrange fully tailored trips to Tibet at a guaranteed cheapest price. Auberge et personnel agréables. Très bien situés, tout près d'une station de métro centrale. L'excursion pour la muraille était très bien. Wifi ok. Possibilité de repas sur place. Very nice hotel, would not hesitate to go again! Room is clean, bathroom could be a little bit cleaner but is overall very good. Water pressure in the shower is not very good, but the hotel itself is clean, the staff is nice, the location is incredibly good and the tour to Mutianyu Great Wall is good quality!!! Chambre seule petite, la propreté de la chambre et salle de bain peut être améliorée. (séjour effectué mi octobre 2016) L'hôtel est à 5-6 min de marche de la grande rue commerçante et la street food, et à 20 min de la cité interdite. Il est relativement bien placé à 2 min du metro (entre 3 et 7 rmb) si vous n'aimez pas marcher. Le dortoir de 4 personnes est petit, la salle de bain est privative et n'est pas pratique. Le plafond est tres bas et comme partout en chine, la douche est au dessus des toilettes. Le personnel est super sympa. Indications en chinois pour la gare. L'auberge est très bien placée, les chambres sont relativement propres et le personnel parle correctement anglais, ce qui est assez plaisant pour se faire comprendre, et pas forcément habituel en Chine. L'espace en lui même reste petit et il n'y a pas de coin cuisine pour préparer ses repas soi-même ou son pic-nic pour le lendemain. Dans l'ensemble je recommande, surtout pour l'emplacement et le coté cosmopolite de l'auberge !! C'est un hebergement qui est fonctionnel, c'est tout. Bons lits, petite bouilloire pour l'hiver c'est sympa, à 500m d'un métro qui comprend 2 ligne (principal avantage de cette auberge). Notre chambre double était petite, pas très bien agencée, 2 lits séparés impossible à rapproché, le pommeau de douche accroché sous le ballon d'eau chaude entre le lavabo et le WC, sans raclette pour un peu enlever l'eau une fois douché. Pas de brosse à chiotte (pour la vie à 2 c'est pas glamour).